Flowers and bicycles go hand in hand. One of the loveliest events we've seen anywhere in the world is the Bicycle and Flowers Festival in Riga, Latvia. But what about if you want some permanent plant growth adding some green to your machine? And the Bicycle Vase just isn't big enough for your green thumb needs? Two Danish designers, Mads Busk Larsen and Jacob Bang Korsholm have been thinking about this and they have developed a design for a bicycle flower pot. They were kind enough to let us test it out, above. The first thing we noticed is how many people smiled at us at red lights. 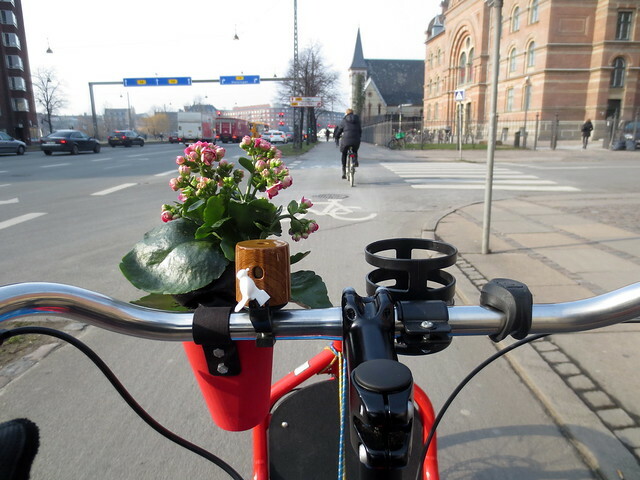 Above, the flower pot looks lovely on the handlebar of my Bullitt cargo bike, together with the little wooden bike bell. The flower pot is designed so that the small plants and flower pots you can buy at supermarkets will fit. With the earth and roots in a small fabric bag, the plant is stable in the pot. You can attach it to your handlebars, but there's no reason you can't attach it elsewhere on your bike, like on your back rack, for example. While many Copenhageners park in bike sheds in their back yard, bikes are often parked out in the open, so the plant will grow under the same conditions as if it were in your garden. Mads and Jacob are looking at a series of colours to suit different tastes. Colour coordination is always important. 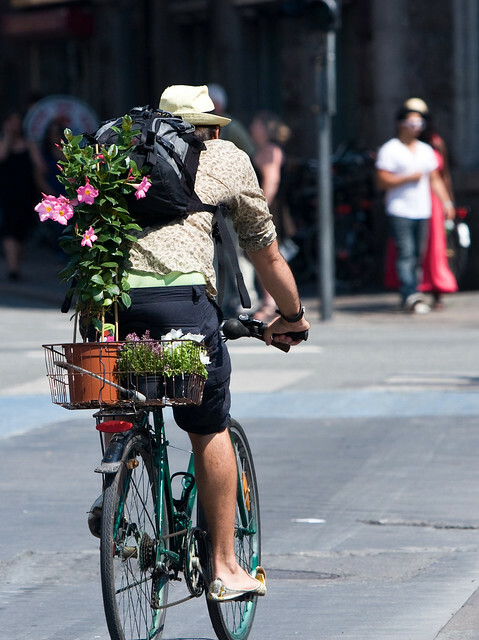 We love the Bicycle Flower Pot. Nothing wrong with some more green in any city. Of, course, if one lovely plant isn't enough, you need to go BIGGER.